Used these to replace some SRAM MRX grip shifters that were too stiff for a youngster to use. Nothing flash, these did the job perfectly. This is the second set of shifters I have fitted to replace the twist grip variety. They are great - no more complains of chain sprocket grinding / missed shifting. Great site, good price, excellent service and delivery. These replaced the original stock twist grip with no problems, using either the new cables provided or your existing cables. They are so much easier to use, accurate and now make changing gears a joy. The wife was so impressed that she even bought some for her bike! Excellent service, Product (Shimano Tourney 6 Speed Shifters) work fine but fixing them firmly on the handlebars proved difficult a more robust clamp fitting would be preferred to prevent the shifters from slipping. Excellent, the service was quick, both as regards sending off and delivery. The items were as requested. Very pleased, most certainly will check your site again. Are these shifters available for 8-speed drive trains? 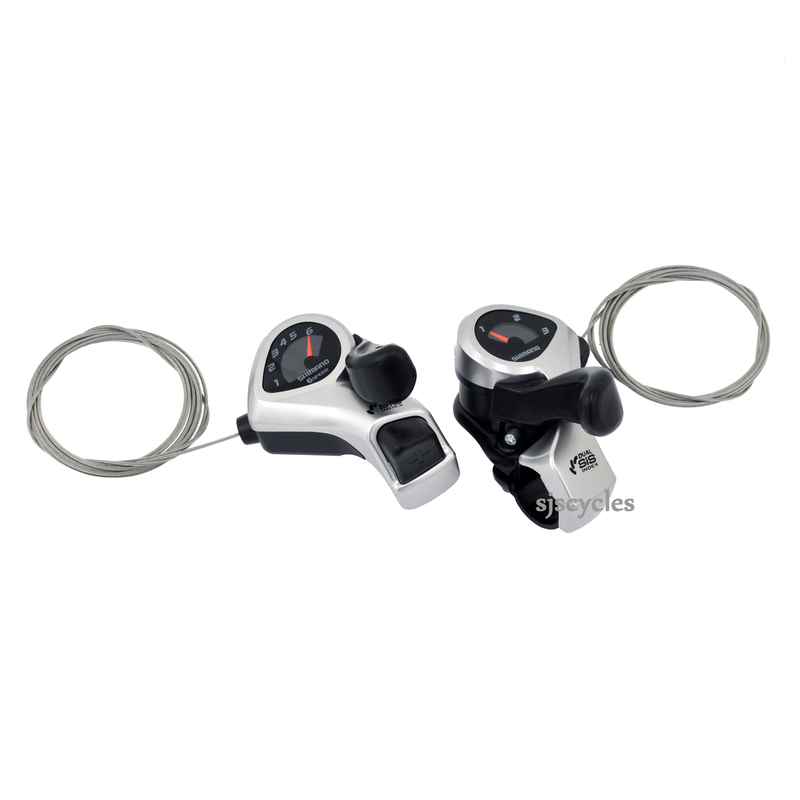 Unfortunately this particular style of shifters are only available in 6 or 7spd, but we do offer a number of other shifters in 8spd that would still be compatible with a Shimano drive train. Is the left hand shifter indexed or friction only? The left hand shifter is indexed. Do You Think The Clamp Will Spread Enough To Fit 23.8Mm? I'm afraid the construction of the clamps on these shifters would not allow them to spread wide enough to fit 23.8mm handlebars. Unfortunately we don't have any shifters that fit to a 26mm bar, on 26mm bars its normally only the stem clamp that is 26mm. On normal flat bars which is what all of our trigger shifters are designed for they use 22.2mm bar diameter where the shifter clamps to. What Diameter Handlebar Will These Fit? Hi, these are designed to fit handlebars that have a 22.2mm diameter which most mtb bars taper down to.